The strength of Visionary iGaming is in live dealer casino games delivered straight to the player on their PC. The company was only formed fairly recently (in 2008) and offers a few different ways for operators to use their system. They are beginning to make more of a mark in the industry and the planned introduction of more live dealer games should help see more online casinos choose their offerings. Since starting out ion 2008 Visionary iGaming has aimed to gain a very specific place in the market place. 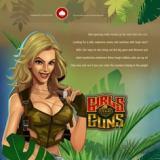 They focus very much on live dealer games and have developed a number of ways of getting these games out to players. At the time of writing there are a few casinos that use their platform but only time will tell whether they can make a bigger breakthrough and join the elite level of casino software providers. As the focus of this company is on live dealer games we might as well start by looking at them. At the moment they offer three different games in this format; Live Baccarat, Live Roulette and Live Blackjack Early Payout. The official Visionary iGaming site says that some new live dealer games are coming soon, with Live Poker and Live Blackjack mentioned. The firm offers different ways for their products to be used, which can lead to their games being added to online casinos, being used to set up an entirely new casino site or else used with PC terminals in physical locations like betting shops. Perhaps the most interesting approach is the one which is called Casino in a Box and which allows players to go into a betting establishment and play these games anonymously by putting cash into the system and using a supplied PC. Away from the live dealer games there are other games offered by the software developer as well. Sites that are powered by Visionary iGaming will normally include flash based slots and other casino games developed by other firms. The live dealer games that the firm is most well known for are simple to play and feature a live chat facility that makes them as lifelike as possible. Their site promises that the games can be made available in any language and in any currency. The live games themselves are transmitted from both land based casinos and studio environments. One notable feature is that the company states that their Blackjack Early Payout game is the highest paying Blackjack game on the Internet, with a reported 99.5% payout. The firm is fully licensed for the markets they work in, although no details of any firms carrying out independent checks on their fairness on their behalf could be found.